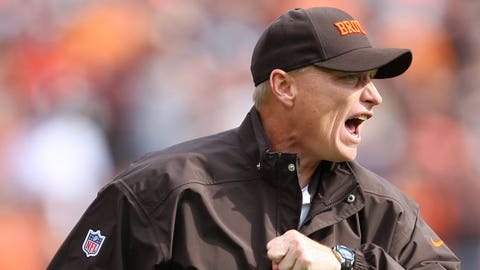 Cleveland Browns special teams coordinator Chris Tabor during the second quarter against the Cincinnati Bengals at Cleveland Browns Stadium. Browns beat the Bengals 34-24. BEREA, Ohio–Two down; one to go. Mike Petttine started assembling his staff by adding eight assistant coaches on Monday night, including two coordinators. Five of the coaches hired were on the defensive side of the ball, two from special teams and one from offense. Jim O’Neil was hired as defensive coordinator and Chris Tabor was retained as special teams coordinator from Rob Chudzinski’s staff. This is the third head coach Tabor has served under with the Browns. He was hired by former coach Pat Shurmur and then retained by Chudzinski. Also retained from Chudzinski’s staff were assistant secondary coach Bobby Babich and assistant special teams coach Shawn Mennenga. Also hired were Chuck Driesbach (linebackers), Brian Fleury (assistant linebackers) and Jeff Hafley (secondary). Brian Angelichio was the only offensive coach hired and he will coach the tight ends. O’Neil served under Pettine, who was the defensive coordinator for the Bills last year as the linebackers coach. He worked with the outside linebackers, which as a group helped set a franchise record with 57 sacks, second most in the NFL in 2013. The Bills defense finished 10th in the NFL in total defense, after finishing 22nd (362.9) in 2012. Buffalo also led the NFL in opponent completion percentage (55.3), and finished second in interceptions (23), third in opponent quarterback rating (74.9), fourth in passing defense (204.4), sixth in yards per play (4.90) and tied for sixth in takeaways (30). O’Neil was with Pettine and the Jets for the previous four seasons. 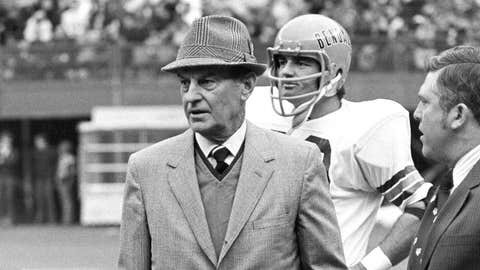 Prior to entering the NFL coaching ranks, O’Neil spent eight years on the college level. O’Neil, Driesbach and Fleury were all on the Bills defensive staff last season. Driesbach spent last season as linebackers coach with the Buffalo Bills following 36 years coaching on the college level. He worked with the inside linebackers, teaming with Pettine and O’Neil to complete one of the best seasons by an NFL defense in 2013. Driesbach oversaw the development of second-round pick Kiki Alonso, a linebacker who was named the Professional Football Writers of America (PFWA) 2013 Defensive Rookie of the Year. Fleury was defensive quality control coach on the Bills staff in 2013, his first season in the NFL. He spent the previous four years (2009-12) as secondary coach and special teams coordinator at Towson University. Hafley begins his third season in the NFL, after spending the previous two years with the Buccaneers, including 2013 as safeties coach. He joined the Bucs in 2012 as assistant defensive backs coach. Tabor, retained by Pettine, was initially named the Browns’ special teams coordinator in 2011. Prior to joining the Browns, Tabor spent three seasons (2008-10) as assistant special teams coach with Chicago. During Tabor’s tenure with the Bears, Chicago consistently ranked among the league leaders in numerous departments. Angelichio, entering his 20th year in coaching, joins the Browns from the Tampa Bay Buccaneers, where he spent the past two seasons coaching tight ends. Previously, he coached tight ends at Rutgers (2011) and the University of Pittsburgh (2006-10). Babich, interviewed and retained by Pettine, first joined the Browns as assistant defensive backs coach in 2013. He spent the previous two seasons with the Carolina Panthers as a defensive assistant (2012) and administrative assistant for the coaching staff (2011), assisting with day-to-day operations and working with the nickel backs. Mennenga enters his fourth season as the Browns’ assistant special teams coach, having first joined the team in 2011.